Advertising is a pretty simple concept — you spend money in order to make even more money in return. It’s an investment, plain and simple. If you don’t look at advertising as an investment, then you will not be taking full advantage of all it can do for you and your business. As investments go, advertising should be right at the top. Insurance companies certainly think so, and their entire business is about maximizing their returns and minimizing their losses. In fact, insurance companies will invest more in advertising than they will in college students. Way more. But the average person doesn’t know this because insurance companies don’t advertise things that make them look like the huge Goliaths they are. They advertise the “good” things about themselves, like the fact that they give out college scholarships and “invest” in today’s youth. And we believe them. 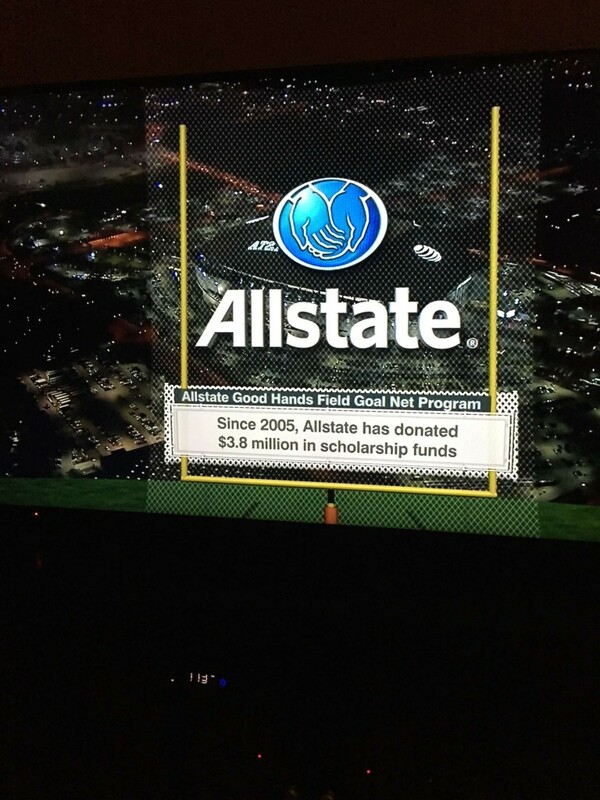 This screen image from a recent NFL playoff game shows Allstate Insurance patting themselves on the back for giving out millions of dollars in scholarships over the past nine years. $3.8 million, to be exact, in nine years. Sounds nice, huh? Those Allstate people are paying it forward, helping young ones get a start to a bright future because they see it as a great investment. This is Allstate. This is an insurance company that makes billions. $3.8 million in nine years really means that each year they give a measly $400,000 in scholarships. That’s pocket change to them. They CAN invest more in our youth. Way more. But we, the general public, hear that they give millions and we give them credit for helping and investing in our youth. College kids must not be that good of an investment, otherwise I’m sure Allstate would do more for them. Think about this: while Allstate invested about $400,000 on college students in a year, they also invested over $486 MILLION in that same year on advertising media. That’s right, Allstate put 1,000% more money into helping themselves than they did helping college students (note, this $486 million is reported in Advertising Age’s “Marketing Fact Pack” published on Dec. 29, 2014). I’m angry about this, and impressed. I’m angry that Allstate gives so little to others, and yet they get away with promoting it because we all just don’t know the truth, and they can simply declare that what they’re telling us is impressive. “Since 2005 . . .” is sneaky. It sounds great. We’re thinking “for a long time now, Allstate has given money.” The fact that they publicize $3.8 million means that they know that we’re not paying attention. As I said, it’s only $400,000 per year. I’m impressed that Allstate, and insurance companies in general who are nothing more than gambling risk managers, know so well the power of investing in advertising. They know word-of-mouth referrals are far less valuable in their industry, since everyone has a horror story or two with each and every insurance company. They know they have no products, and no inventory. They take in as much money as possible and pay out as little as possible. That fact that Allstate is willing to invest $486 million in advertising media versus only $400,000 in students in one year should give you a clear picture that advertising works. — and also that Allstate thinks it’s a better investment than students.